The Boston Patriots were in a battle for first place in the AFL Eastern Division as they hosted the Houston Oilers on November 6, 1964. Head Coach Mike Holovak’s team won its first four games and was 5-2-1 and competing with the Bills – the club they had defeated in a playoff for the division title in ’63. Key players on offense were 34-year-old QB Babe Parilli and Gino Cappelletti, a slow but dependable end who also was a dependable placekicker. The defense was outstanding, particularly the line and MLB Nick Buoniconti. The Oilers, coached by Sammy Baugh, were a disappointing 2-6, having won two of their first three contests before dropping five straight. The team that had dominated the division for the first three years of the AFL’s existence slumped badly in 1963 and was clearly in trouble. There were promising younger players on the squad, but the nucleus on offense was still 37-year-old QB George Blanda, 29-year-old flanker Charley Hennigan, and fading fifth-year FB Charley Tolar. The Friday night game at Fenway Park was billed as “do-or-die” for both teams. Houston got a break on the opening kickoff when HB J.D. Garrett fumbled at his 29. The ensuing series ended with Tolar powering two yards for a touchdown. The Patriots came back with a 75-yard drive. FB Larry Garron ran effectively and Babe Parilli finished the series off with a one-yard run around end for a TD. Early in the second quarter, Gino Cappelletti put the Patriots ahead by 10-7 with a 25-yard field goal. Cappelletti added another field goal from 33 yards with six seconds remaining in the half and it was 13-7 at the intermission. Boston’s lead disappeared quickly when, on the first play from scrimmage of the second half, the Oilers pulled off a spectacular play as Blanda threw to TE Willie Frazier for an 80-yard touchdown. With Blanda’s extra point, Houston was back in front at 14-13. Late in the period Boston regained the lead when a five-play, 75-yard drive that was highlighted by a Parilli pass to split end Art Graham for 64 yards and ended with Cappelletti kicking his third field goal from 22 yards out for a 16-14 score. At 6:46 into the fourth quarter the Oilers went ahead once again when Blanda threw to split end Charley Frazier for a 38-yard TD. A few minutes later it was Parilli once more rolling out and running for a touchdown, this time from five yards out. However, the try for a two-point conversion failed as Parilli’s pass intended for Graham fell incomplete. With a minute to go in the game, the Patriots were up by a point and the Oilers had the ball at midfield. Blanda threw to Willie Frazier twice to get the ball down to the Boston four. Tolar wasn’t able to penetrate the end zone from there and Blanda kicked a 10-yard field goal. With 32 seconds remaining, it appeared that Boston’s fate was sealed. There was still time, however, and Parilli completed two passes to TE Tony Romeo and Cappelletti to advance the Patriots into Houston territory. With the clock running down, Parilli rolled out, couldn’t find a receiver, and, keeping the ball, took off down the sideline. Knowing he couldn’t reach the end zone, he stepped out of bounds at the Houston 34 with one second remaining to play. Cappelletti was successful on his field goal attempt from 42 yards and the Patriots came away with a stunning 25-24 win. Boston had more total yards than the Oilers (440 to 413) but Houston had the edge in first downs (22 to 21). The Patriots turned the ball over twice while the Oilers suffered one turnover. Houston was also very effective at returning kickoffs, with DB Benny Nelson gaining 66 yards on his two returns and HB Ode Burrell averaging 27.7 yards on three returns. Babe Parilli completed 14 of 29 passes for 256 yards with no touchdowns and one intercepted, but also ran the ball 8 times for 96 yards and two TDs. Art Graham (pictured at left) had a big day with 8 catches for 167 yards. Larry Garron rushed for 91 yards on 23 carries. For the Oilers, George Blanda went to the air 44 times and had 20 completions for 328 yards and two TDs with one intercepted. Charley Frazier had 9 pass receptions for 143 yards and a touchdown and Willie Frazier, thanks to the long scoring play, gained 102 yards on his two catches. Charley Tolar was the team’s top rusher as he gained 57 yards on 14 attempts and scored a TD. The win over Houston was the first of five straight for the Patriots, who stayed in contention for the Eastern Division title until the final week of the season. As it was, they put together a 10-3-1 record in placing second to the Bills. Houston continued to fade and, with wins in the last two contests, ended up at 4-10 and at the bottom of the division. 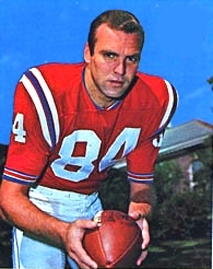 Babe Parilli (pictured above) led the AFL in passing yards (3465) and TD passes (31) – and, more unfortunately, in interceptions (27, tied with George Blanda) – while ranking second in pass attempts (473) and completions (228). He was a consensus first-team All-AFL selection and was named to the league All-Star Game. 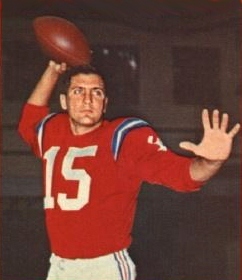 Gino Cappelletti led the league in scoring (155 points) and field goals (25, in an AFL-leading 39 attempts), each for the third time. He caught a career-high 49 passes for 865 yards and seven touchdowns and was named AFL Player of the Year by the Associated Press and United Press International. Cappelletti, too, was selected for the AFL All-Star Game.